Did you spot the specially marked 18 ounce adult-size cups at Chuck E. Cheese’s? These cups are part of the popular Chuck E. Cheese’s Rip It, Win It Instant Win Game. New this year, there’s over $27,000,000 in prizes available to be won. It’s definitely an instant win game you don’t want to miss in 2018. Now through March 11, 2018, a total of 6,626,000 specially marked 18 ounce adult-size cups are available for distribution at participating Chuck E. Cheese’s locations. Pick up one of those cups with the purchase of a beverage then carefully peel the Game Piece to see what you won. You may also request a free Game Piece by mailing a self-addressed stamped business-sized envelope in an envelope to: Chuck E. Cheese’s 2017 Rip It, Win It. Play It Game Piece Request, P.O. Box 251328, West Bloomfield, MI 48325. If a Game Piece reveals a Grand Prize, First Prize, Second Prize, or Third Prize the potential winner must visit ripitwinit.com or chuckecheese.com/peelnwin and enter his/her prize claim redemption code, located on the Game Piece, where prompted. The potential winner must then complete the registration page, which includes, but is not limited to, his/her complete name, residential address (P.O. Boxes will be permitted) and e-mail address. The Chuck E. Cheese’s Rip It, Win It Instant Win Game 2018 is offered only to legal residents of the fifty (50) United States and the District of Columbia who are at least eighteen (18) years of age (19 in Alabama or Nebraska) at the time of participation. available while Game Piece supplies last. The total ARV of all prizes available during the entire Game Period is $27,828,384.42. The total ARV of all prizes available in Florida is up to $1,683,801.55. For a list of winners of prizes over $25, interested individuals should mail a self-addressed stamped business envelope to: Winners List, Chuck E. Cheese’s 2017 Rip It, Win It Instant Win Game, P.O. Box 251328, West Bloomfield, MI 48325. Vermont residents may omit return postage. Winner List requests must be received no later than May 31, 2017. Sponsored by CEC Entertainment, Inc., 1707 Market Place Blvd., Suite 200, Irving, TX 75063. 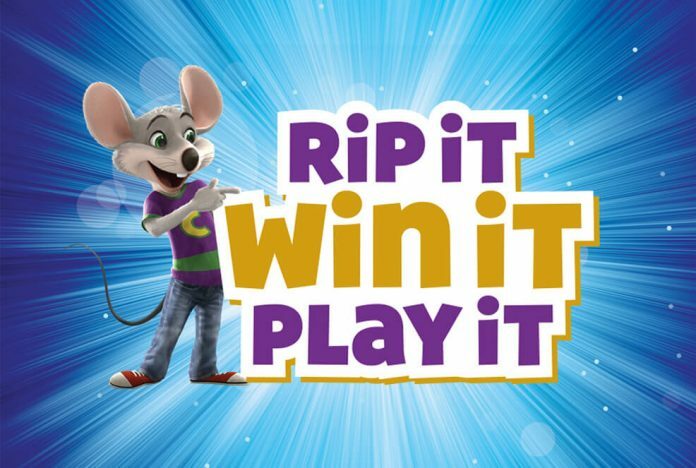 For more information on the Chuck E. Cheese’s Rip It, Win It Instant Win Game 2018, including official rules, visit ripitwinit.com now!